CRPF officials have reportedly confirmed that around 25 others were also injured in the attack. Report said that the Pakistan-based Jaish-e-Mohammad (JeM) has claimed responsibility for this heinous crime. In one of the biggest ever terror attack in Jammu and Kashmir, at least 44 jawans of the Central Reserve Police Force (CRPF) were martyred on Thursday evening in Pulwama district's Awantipora town, news agency ANI reported. A suicide bomber belonging to the terrorist outfit Jaish-e-Mohammad drove a SUV packed with 300 kg explosives into a CRPF bus with 39 jawans on board, which was part of a 70-vehicle convoy. The suicide bomber used a vehicle-borne improvised explosive device (known as VBIED) to target the convoy. Terrorist attack took place after the SUV with terrorist crossed security barricades to ram into the CRPF bus. Second bus has relatively suffered lesser damage than the firs bus. A Local Tata Sumo used for attacking the convoy. Top security sources say there was input that the Jaish terrorists were collecting large quantities of explosives but their exact intent was not known. As per interception specific info sent to security forces about Masood Azhar close associate Abdul Rasheed Ghazi. Abdul Rasheed Ghazi is a JeM cadre amd trained terrorist. Abdul Rasheed Ghazi is a trained Afgan IED expert and Main Trainer of JeM arms and explosive. He has entered with 2 more terrorist in pulwama south Kashmir. He has been tasked by Maulana Masood Azhar to impart training to Local Terrorist to Avenge killing of Usman and Talha( Nephew of Masood Azhar). A suicide bomber targeted a CRPF convoy, which were carrying paramilitary personnel from 54th CRPF Battalion from Jammu to Srinagar, and had over 70 vehicles and more than 2,500 personnel. US Envoy to India Kenneth Juster reportedly said that U.S. Mission in India strongly condemns today's terrorist attack in J&K. We send our heartfelt condolences to the families of the victims. The United States stands alongside India in confronting terror and defeating it, he said. Sources told ANI that an NIA team with suitable forensic component will leave tomorrow morning for Kashmir to assist the Jammu and Kashmir Police in forensic evaluation of the spot. At 9:20 pm: Home Minister Rajnath Singh, says,"The attack was carried out by Pakistan backed Jaish e Mohammed. A strong reply will be given and I assure the people of the country this." At 9:00 pm: Mobile internet services have been snapped in the whole of South Kashmir and speed slowed to 2G in Srinagar district, ANI reported. 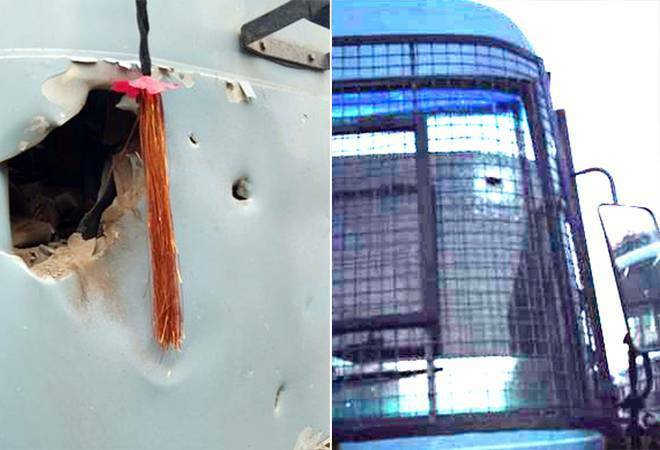 The convoy of two buses carrying paramilitary personnel from 54th CRPF Battalion was caught in a high intensity IED blast, followed by gunfire from militants on the Jammu-Srinagar highway near Goripora area of Awantipora region which led to the casualties. Report said that the Pakistan-based Jaish-e-Mohammad (JeM) has claimed responsibility for this heinous crime and released a video clip of the suicide bomber, a 'commander' identified as Adil Ahmad Dar. CRPF officials have reportedly confirmed that around 25 others were also injured in the attack. Prime Minister Narendra Modi has strongly condemned the terror attack and said that the sacrifices of 'brave security personnel shall not go in vain'. "The entire nation stands shoulder to shoulder with the families of the brave martyrs. May the injured recover quickly," PM Modi said in a tweet. He also spoke to National Security Advisor (NSA) Ajit Doval. The Congress party chief Rahul Gandhi said he was "deeply disturbed by the cowardly attack". "My condolences to the families of our martyrs. I pray for the speedy recovery of the injured," he tweeted. Mehbooba Mufti, former Jammu and Kashmir CM, tweeted, "Disturbing news coming in from awantipura. Twelve of our security personnel have been martyred and several have been injured. No words are enough to condemn the gruesome terror attack. How many more lives will be snuffed out before this madness ends?" Delhi Chief Minister Arvind Kejriwal also condemned the attack. "Extremely shocking news coming from Pulwama (J&K). I strongly condemn the terror attack on CRPF convoy in which many casualties are feared. India must stand united in this moment of grief," Kejriwal said in a tweet. Former Jammu and Kashmir CM Omar Abdullah said, "A number of CRPF soldiers are reported to have been killed & injured in an IED blast. I condemn this attack in the strongest possible terms. My prayers for the injured & condolences to the families of the bereaved." West Bengal CM Mamata Banerjee said, "We salute our brave jawans and extend our solidarity and condolences to their families. Our prayers for those injured. We wish them a speedy recovery."